For those of you who noticed last week, we silently released one of the biggest updates since our initial launch. Instead of limiting OptinMonster to selected email service providers, we introduced the functionality to integrate any custom HTML form in OptinMonster. This now allows you to use OptinMonster with just about every major email service provider. With the addition of custom HTML forms, you can also use it to add multiple form fields. 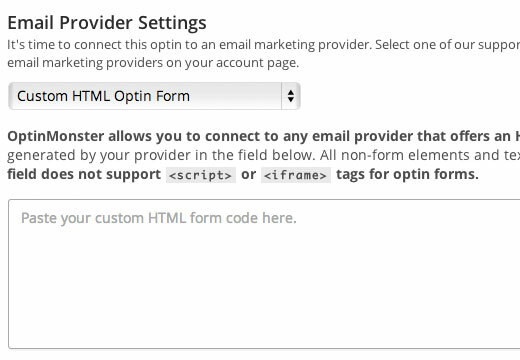 Previously OptinMonster was limited to only Name and Email field, but using the custom HTML form allows you to add additional fields, checkboxes, radio buttons, etc. Since the current themes are only designed for two fields, we added the ability to add custom CSS right from the design customizer. This will allow users to customize the designs with simple CSS. This is a great addition for designers and savvy users who are familiar with CSS because now your design possibilities are endless. 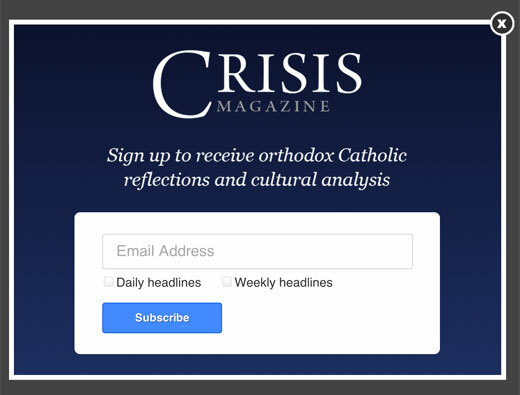 Several users asked for the ability to manually trigger the lightbox popup rather than having it load on a timer or exit-intent. We listened and included the ability to manually load OptinMonster popup with click of a button. See the how-to tutorial here. By default OptinMonster forces you to use double-optin, and several users asked for alternatives. With the custom HTML form, you can use single-optin feature in Aweber. For MailChimp, we added an API filter that allows you to enable single-optin. See how to enable single-optin for MailChimp. Note: For single-optin please read the rules and terms of service of your email service provider first. For sites that are trying to save server resources, we added the ability for you to turn off OptinMonster reporting. Although this only applies to less than 1% of our users, we wanted to add this solution for those who needed it. Several users requested the ability to reset stats for each optin, so we added that functionality in the admin user interface. In this release, we also introduced the OptinMonster Global Cookie function. This is very useful for sites that are using multiple different optins types. Once a user has successfully subscribed using one of your optin form, then the global cookie will prevent any other optins from loading. This will significantly improve the user experience. Aside from these major functionality, there were several bug fixes and enhancements. See the changelog for details. Stay tune with OptinMonster because we’re working some very exciting stuff. Expect another major release from us later this month.